Los Angeles (AP) – At the end of the monsters-versus-robots flick “Pacific Rim,” a breach at the bottom of the Pacific Ocean is closed, plugging a hole that allowed hellish creatures to emerge and terrorize the globe. But after the movie earned $400 million worldwide, was that portal really going to stay closed? 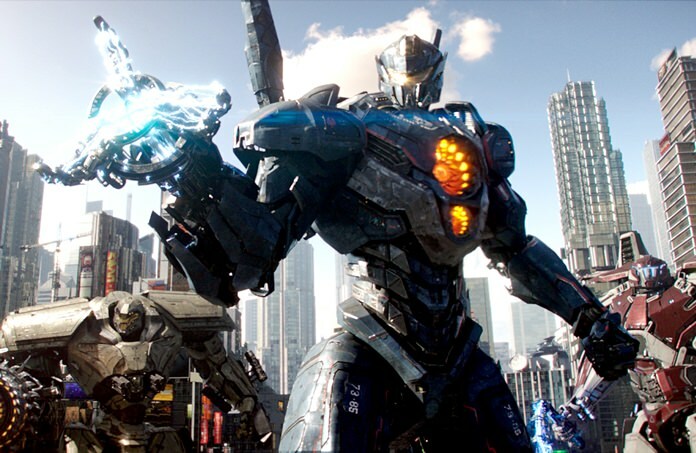 “Pacific Rim Uprising “ uses a lighter palette and is geared toward a younger audience than its 2013 predecessor, but it keeps all the key elements, upping the special effects and finding honest moments and humor in the midst of world-destroying carnage. It satisfies on every front. Boyega, fresh off his “Star Wars” gig, is great here and plays a dashing rogue who struggles under his father’s shadow but soon earns the respect of his peers. “We are a family now and we are Earth’s last defense,” he says. He and Spaeny have an easy rapport and some moments between them seem genuinely charming and goofy. Part of the success of the “Pacific Rim” films is that they have cobbled together enough elements of other films to make them familiar yet newish. They owe “Blade Runner,” ‘’Independence Day,” ‘’Minority Report,” ‘’Star Wars” and, of course, “Transformers” — not to mention every Godzilla movie ever made — some residuals. But they also have defined and introduced their own world and language.